The ascendant lord gets kendra bala (power) in this house since fourth house is one of the four kendra houses. If ascendant lord is placed here, the native will be happily surrounded by relatives, and will be attached to his mother and maternal relations. He will be having lots of movable and immovable assets like houses, lands etc. The native enjoys all sorts of comforts in life. He will be having good vehicles and conveyance. All the above said, results only when the lord of ascendant is placed favorably in fourth house, otherwise negative results are expected. Ascendant lord Mars gets debilitated here. All the above said results are negated here. Since the ascendant lord loses its power here he will be dependent to his relatives. The native will hardly have own house and vehicles. 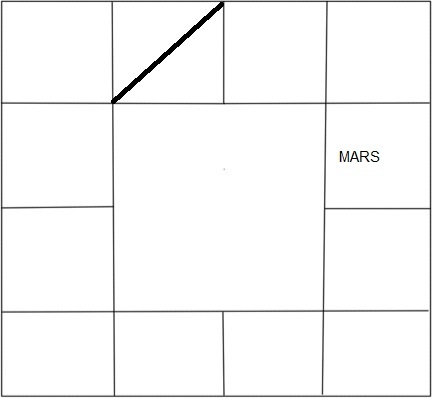 Mars loses its directional strength also here. Venus would be in Leo. Venus shows enmity here. Native gets comforts and luxuries through his wife. His house will be beautiful and hard earned one. Native will be having comfortable life. 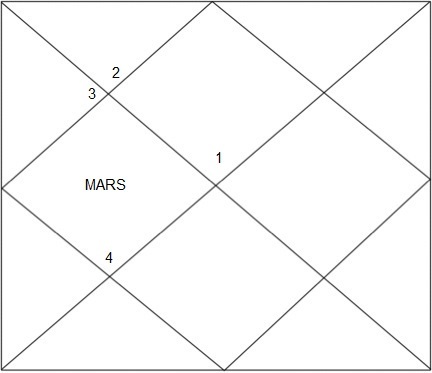 If Venus is in 2nd quarter of Magha nakshatra or 3rd quarter of purva phalguni/puram nakshatra, results will be very good. Mercury will be in Virgo, its exaltation sign. Native will earn lots of movable and immovable assets by his own. He leads a peaceful and comfortable life. He is more affectionate to his mother and maternal relations. But since mercury gets kendrathipathya dosh also here may face some difficulties during his dasa, pukthi period. Moon would be in Libra. Native will be a lover of luxurious things. Native would be having good vehicles and conveyances. Though moon gets neutral here in Libra, it gets directional strength here. 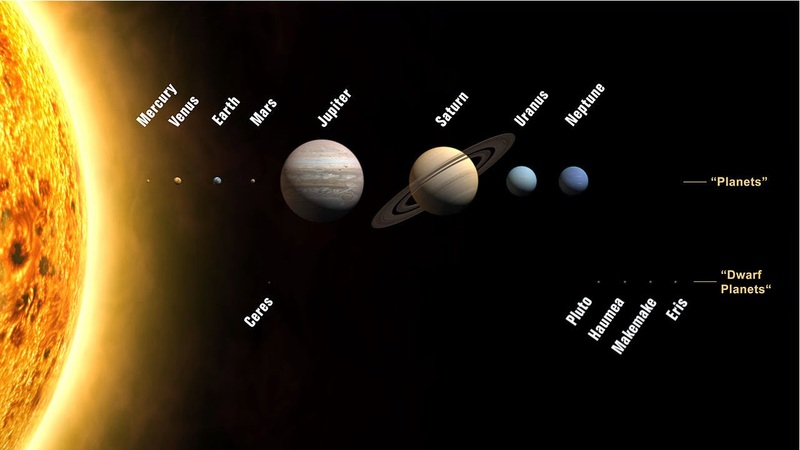 Since moon is the karaka for mother and fourth place is house of mother, as per the “karako bhava nasthi” concept, relation to his mother would be questionable. Sun would be in Scorpio. In Scorpio, Sun is friendly. Native would be having good big house. Since sun loses its directional strength, native will have to find hard time to get house, to maintain relationship with relatives. But since sun aspects the tenth house, government job can be predicted. Mercury will be in Sagittarius. Mercury gets kendradhipathya dosh here. But since Sagittarius is owned by Jupiter, a full benefic, native somehow finds a own house. If mercury is in 3rd quarter of moola nakshatra or 2nd quarter of Purva Ashadha/puradam, results will be very good. Venus will be in Capricorn. Venus is friendly here and it gets directional strength also. Native gets beautiful and luxurious house and vehicles. He has good relation with his mother. If Venus is in 4th quarter of Uththara Ashada/Uththiradam nakshatra or 2nd quarter of Sravana/Thiruvonam nakshatra then results would be doubled. Mars would be in Aquarius. Mars would be enemy here. He loses his directional strength also here. So, he doesn’t perform well in this place. But if placed in 4th quarter of Dhanishta/Avittam nakshatra or 2nd quarter of Sathabhisha/Sathayam or 1st quarter of Purva Bhthrapada/Poorathadhi, native can have some positive results in above mentioned points. Jupiter would be in Pisces. Jupiter will be in his own house. So, he enjoys all the matters related to house, vehicles and mother. He leads a comfortable life. But since Jupiter here gets kendradhipathya dosh, some negative impacts would be there, but native overcomes those negative impacts. If placed in 4th quarter of Purva Bhadrapada/Poorattathi or4th quarter of Uttara Bhadrapada/Uththirathai then results would be doubled. Saturn would be in Aries. This is his debilitation sign. The native will hardly have own house. Even if the native gets any own house, that would be small and old house. Native’s relationship with his mother will not be good. If placed in 3rd quarter of Bharani nakshatra, then native overcomes from these problems. Saturn will be in Taurus. Saturn is friendly here. He gets good house and vehicles. The native is likely to get old auctioned assets. If Saturn is placed in 2nd, 3rd pada of kritika nakshatra, Saturn performs well during his dasa period. Jupiter would be in Gemini. Jupiter shows enmity here. So, Jupiter performs moderately when placed in Gemini. Jupiter gets kendrathipathya dosh here. But if Jupiter is placed in 1st or 4th quarter of Ardra/Thiruvathirai nakshatra then there are some positive effects indicated to the native related to house, vehicles and comforts in life.